Support Your Elementary School – Buy a Kid Tag Today! Kids Tag Art is getting more attention than ever! 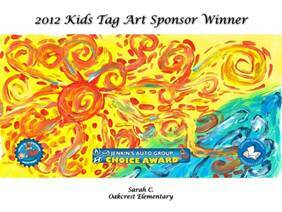 As many as 22 Florida Tax Collectors are now participating in the popular Kids Tag Art program. The program, which annually showcases student artwork designed as vanity tags, is now available for holiday gift-giving. And, with it comes the most unique and creative artwork, inspired by this novel art program that has now spread across the state from panhandle to the Everglades! According to Eric Zwayer, Tax Collector for Highlands County, “this important program not only serves as a fundraiser for classroom art supplies, something most art teachers go into their own pockets to fund, but it is also a way to elevate the conversation regarding the importance of creative expression as part of a S.T.E.A.M. curriculum.” S.T.E.A.M. stands for Science-Technology, Engineering, Art and Math and art educators are quick to tell you how fundamental the “A” is in a rigorous S.T.E.M. curriculum. The Florida Tax Collectors’ Kids Tag Art program inspires young artists to create their own unique design, learning the practical application of license plate art to support worthy causes, fashioned after Florida’s 100+ specialty license plates. However, these tags are strictly art and not for use as legal identification on the rear bumper of cars. This year, the Florida Tax Collectors’ Kids Tag Art program will pass an important milestone, when they will have raised over $1,000,000 for classroom art education. A celebration in Tallahassee is planned for later this spring. In the twelve years it has been in existence, over 22 Tax Collectors have joined together to host this program in their county’s public, private and charter schools. Each Tax Collector is responsible for the promotion in their county, attracting local sponsors and hosting their annual awards ceremony. Greg Masters, the co-owner of Southern Homes, a home builder for first time home owners in the Central Florida market and the major sponsor of Kids Tag Art in Polk County, puts it this way, “ “This program encourages creative and critical thinking, both of which are needed to grow a future innovative workforce. Our involvement with Polk County Kids Tag Art has been very rewarding.” Southern Homes has given $100,000 to the program to date. The idea for the project came from the Great American Teach-In, where Tax Collector staff would volunteer in area school classrooms and instead of talking about taxes, they would share specialty tags and talk about the important work that these foundations do with the funds raised from the purchase of their tag. Teachers would send artwork from those classrooms to the tax office, as a thank you for their visit. The artwork was so inspiring, instead of discarding, it was saved until in 2005 when the idea of turning it into a drawing contest and school fundraiser was born. So, in 2006, the Tax Collector’s Office for Polk County, with help from local businesses and community groups, put together a fundraising project with Polk County Schools that would teach children art design while raising much-needed monies for classroom art supplies. Initially, the design phase of the project began in September, when teachers would share specialty tags with the class and engage the students in classroom design creation. Teachers can choose whatever guidelines for their students they believe will generate creative, award-winning artwork. Parents can purchase their child’s design through school sales conducted in November of each year, in time for the holidays. Their child’s design is individually scanned and made into a unique metal alloy tag which can be purchased as a keepsake or given as gifts. Though roughly the same format is followed by each county, in late October, each Tax Collector office receives in thousands of designs submitted from all across the county for judging. Selections of the top entries from each school are made and an awards program in their honor is hosted by the Tax Collector and key business leaders. Each participating Tax Collector hosts the artwork on their website. In addition, a Tag Art Exhibit of top designs travels around the county and at key arts outreach events. In addition, tags are offered for sale within each Tax Collector’s office throughout the school year. Tax Collectors who are actively hosting the program include George Albright (Marion), Ronnie Brannon (Columbia), John Drew (Nassau), Scott Lunsford (Escambia), Stan Nichols (Santa Rosa), Joe Tedder (Polk), Eric Zwayer (Highlands), Charles Thomas (Pinellas), Vickie Potts (Charlotte), Linda Myers (Putnam), Scott Randolph (Orange), and Larry Hart (Lee).